Look it’s 09, 09, 09 not sure what that all means but some folks think it is significant, to us it means we are in the short rows at the side of the field at the end of the season. These last few weeks for us, as far as crops go, is all about peppers. It is the final major crop of the season and one we have been tending for a long, long time. There are some crops that occupy your attention during planting and growth and not really during the picking, tomatoes are that way, there is so much work in preparing to plant, planting, trellising, suckering, weekly tying up, etc. before you pick the first fruit. Lettuce and greens on the other hand, you plant, then cultivate for weeds once maybe and then it’s all about, sometimes daily, harvesting and washing and worrying about how perishable they are. Peppers on the other hand give you some of both, they are more leisurely. They go in the after the crush of spring planting and are slow growers and while they do require some support they are not reckless floppers like tomatoes. They are in the ground for so long that advance mulching is the only real weed control option and the trellis is simpler and only needs two layers, usually. So for three months there is just the occasional foray into the pepper field until picking begins and then it starts in fits. First a few Jalapenos, then the always eager Cubanelles and Purple bells, finally the rest join in. Again unlike tomatoes that have to be picked twice a week just to keep them from getting too ripe, peppers have a more relaxed ripening pace and just need a once a week going through, the hot varieties every other week. 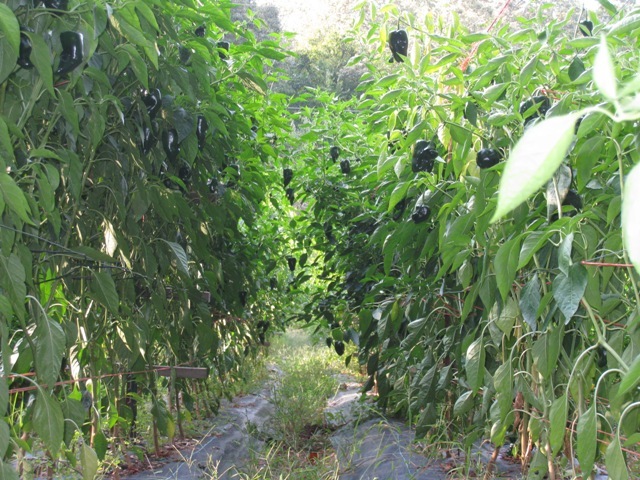 Wednesday is hot pepper day, twenty two varieties in just five one hundred foot long rows. Takes organization and patience to keep them all separated, don’t want to mistake the incendiary Habaneros for the mild Aji Dulces. The hot types mature so slowly that we only pick one side of the row each week, leaving the other side to get big enough to pick next week. Colored bells are the bulk of the crop and we save those twelve, hundred foot long rows for Fridays. Hunched over moving between the rows with five gallon buckets, we look for fully ripe bells in the dark green canopy, pulling up on the fruit to get it to let go. When the bucket is full it’s back to the tailgate of the truck to sort. Inevitably there are some that look ripe but when picked the back side still has some green on it. Sorting entails four containers; full ripe, part ripe, freaks (might have a dry scar but it is sound), got-to-be-dealt-with-in-the-next-few-days (they have a wet spot that will melt down in the box if left with the others) these are the ones we freeze, for us, for the winter. A calmer, less hurried crop, perfect to end the season with.